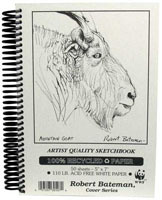 These artist quality sketchbooks have acid-free white paper. They are suitable for pencil, charcoal, watercolour pencil, acrylics, pastels (including oil) and light watercolour washes. At 110lb, they have one of the heaviest papers in a sketchbook that we carry. Each sketchbook contains 50 sheets with a smooth surface.